Featuring 2 personalized white pillowcases with Mr. and Mrs. and last name The size of the pillow case is approx is 20 x 30 and fits standard pillows. This listing does not include the pillows it is only 2 pillowcases. 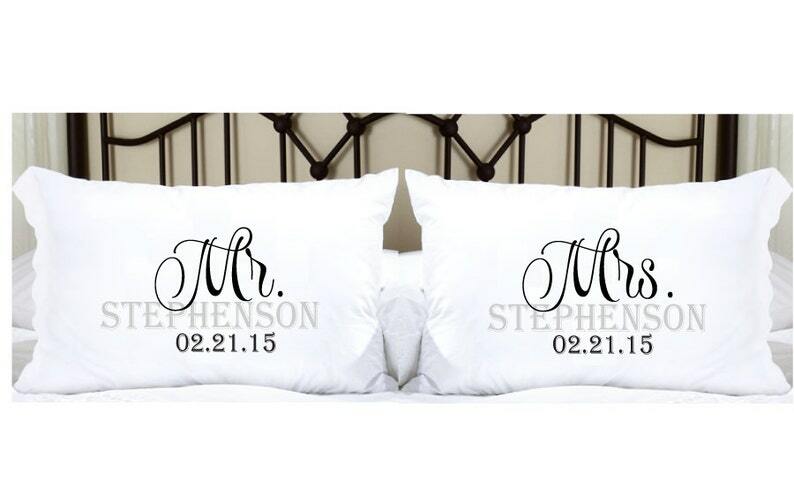 One says Mr. (last name) and the other pillowcase says Mrs.(last name). As shown the opening for Mr. is to the left and the opening for Mrs. is to the right. Simply put this information into the "Notes to Seller" box or copy and paste it. This is not an iron-on or embroidery, it is made using a direct to garment printer just like most everyone else where we use eco-friendly inks that actually get printed directly to the t-shirt. this means no wrinkling, peeling or scratching off. Love these pillowcases! They were sent out quickly! Good quality! I bought these for us, but they would make a great gift! Super soft. Beautifully done. Was SO fun to give these to my sister as a gift. High recommended ! Beautiful. My best friend absolutely loved it for her wedding gift. Thank you so soooooooo much!!! I accept paypal and credit cards and Etsy gift cards. I DO NOT accept refunds or exchanges on any personalized items. Anything to do with your order must be included in the NOTES TO SELLER section. Any changes, names, sizes, anything to do with your order must be put in the NOTES TO SELLER section. I am not responsible and will not issue a refund/exchange if you have not put them in the NOTES TO SELLER section. If your order arrives with defects in the item I will replace the item, but you must notify me within 2 days of receipt of your order. PLEASE NOTE: Product workmanship is guaranteed for 2 DAYS from date of receipt as scanned by the shipping carrier that you choose. This means that any issues with your product MUST be addressed within 2 days of the delivery date. My items are personalized items and these cannot be returned or refunded. Please check your spelling, dates and names carefully. In the event that you made an error and need a replacement, I do offer a 20% discount off the original retail price on the replacement. Of course, if I made the error, I will replace your order free of charge to you. I do not offer refunds or exchanges on shirts that are too small or too big. It is your responsibility to check the sizing and order accordingly. Just a heads up, all the measurements for the shirt sizes are supplied by the manufacturer. That being said the sizing for every run of t-shirt produced by the manufacturer will vary by as much as 1.5 inches in length and in width. As I do not make the shirts, I do not guarantee that the sizing will be specifically as listed. If the sizing is different, I will be more than happy to offer you a 20% discount towards the purchase of a smaller or larger size shirt. ALL Sales are Final. All of my items are custom made, one of a kind (OOAK) items. I do not issue refunds if you make changes to the design, change the colors, change the shirts, order something different than is advertised and you do not like the end results. I carry many different brands of shirts. I carry polyester, cotton and cotton blends. I use the shirt that produces the best vibrant results unless otherwise specified. Most white shirts are done on polyester. Most colored shirts are done on cotton except for light blue, gray youth and adult sizes. I will not issue refunds or exchanges for the fabric of the shirt. The brand of the shirt sent will be determined by the shirt size, not all brands are available in all size. I do not issue refunds if the brand of t-shirt is not what you are expecting. The pictures I show online are overlays and not actual photos of the product. the tshirt you see displayed will not necessarily be the brand you will receive. ALL SALES ARE FINAL. You cannot return product simply because you do not want it or do not like the quality. Product workmanship is guaranteed for 2 days from date of receipt as scanned by the shipping carrier that you choose on all items. I do not reimburse shipping on returned items. Please check the measurements on my size chart before ordering! I will NOT give exchanges or refunds if you order the wrong size or the shirt is too big or too small. Please convo me if you have any questions at all. Please do not assume that what the tag reads matches the child's age. I carry many different brands of t-shirts by many different manufacturers. On the sizing chart I provide the lengths and widths of Rabbit Skins shirts, these are the shirts most often used for the toddler series. I do have other shirts that are used by different manufacturers and I can provide measurements of these shirts for you by request. I suggest measuring one of the shirts that your child normally wears and compare it to the sizing chart. You can always send me a conversation if you have any questions. Typically Rabbit Skins brand runs Small, I list this on every listing. As there is not one manufacturer that carries all the sizes, their colors also differ. The gray shirts will not be the same gray color between toddler and adult shirts nor will the blue. These will not be the same color. Please note**Please include all details on your order. If we have discussed changes in conversations or adding of name please include this when you place your order. If it is not on your order then it won't get done. DOG SHIRTS - - I do not issue refunds or exchanges if the wrong size is ordered. Please send me a conversation first if you are unsure about the size. I will not wait for proof approvals to send your order. Usually there is a grace period of 2 hours from when I do your design to when I actually print it. As I do not do proofs I will not wait for approval to send. COLORS- I use different processes in my work. With the t-shirts there are many different processes I use. However please note that the colors you see on your monitor may not be the color of the end result. With so many different resolutions from tablets, phones, monitors etc your colors might not be the same colors I see or someone else sees, however I use the same design as pictured. When you make color changes to the design I will do the best that I can but I will not issue refunds or exchanges for changes to color. Especially when I use direct to garment printing the colors will sometimes be darker than what you see on your screen as I have to use several passes of ink to ensure that the product is sharp and will not fade. All refunds or exchanges must be REQUESTED in an Etsy message within 2 business days after your tracking # shows delivered. After this timeline I will not issue any refunds or replacements. I do not reimburse shipping on returned items. My shirts are printed on demand, so it usually take me 1 to 4 business days to process the order and then I ship it the day after that. When you place the order etsy.com will give you an expected ship date. Please DO NOT assume you will have your shirt by a certain day. I am on the west coast (California) so please plan for shipment from there. PROOF REQUESTS: I will only give proofs for custom created orders, this does not mean if you have made name changes etc., this means custom orders that you and I have created aside from the normal designs. If you ask for a proof when you submit your order it will be held aside and there will be an additional $5 fee if you must have a proof. I do accommodate these requests but I cannot hold orders up to send a proof to you. Once your order is submitted I am usually working on it. CANCELING AN ORDER: Once your order is submitted it is considered in production. As I try and get my orders out as fast as I can the order usually cannot be canceled after an hour of of submitting it. I will NOT contact you if there is no name or date on your order. I simply would never be able to get the orders out if I checked on all of these orders and there is a good amount of people who do not want a name on their shirt/ornament. As I state over and over please put all info in the notes to seller box. You MUST put any changes and ALL details in the NOTES TO SELLER section. If you do not put a name or date or changes to the design, the design will be sent as displayed without the name or date. If there are no notes from you regarding a name or date then I will not put one. I am not responsible for details that are omitted. Everyone wants their orders shipped asap during the busy times so I will not be contacting you about names, dates, hair colors or any other changes to your order, please double check your order for accuracy, it is your responsibility to double check your order. I am not trying to be rude, I just have alot of production and orders to get out quickly to ensure a speedy delivery. ~Also, as every one of my products is custom made sales are final. ~Any difficult design changes and proofs will DELAY your order by at least 3-5 BUSINESS days. EXPRESS orders usually ship the same day as ordered if the order is placed before 12 noon PST. We always attempt to ship Priority Mail shipments the same day as well. We live in the mountains and pickup times are earlier here than normal. INTERNATIONAL SHIPPING: Shipping international is now very expensive. The prices I have listed are the latest prices as updated by the USPS. Please also note that UK customers now must pay a 25-30% or more tariff tax on their purchases, this is your responsibility. I AM NOT Responsible nor will I GUARANTEE ANY International Shipping. It can take any amount of time to arrive internationally and all sales are final. Please understand once the package leaves the Unites States it enters into your customs area and your postal system. Some are great and others are terrible. I will ship your package as ordered but there is no tracking once it leaves the United States, therefore I have no control at all and it is in the hands of your country. ►How can I add my child's name? There is a little box that says "NOTES TO SELLER" when you add the item to the cart. In this box you can put notes to me such as the name, changing the color, adding the name, changing the saying and anything else that you want. Those essentially are notes straight to me so I can make the changes needed and then print the design to the shirt. Please make sure ALL details are included in this box. ►PLEASE NOTE I no longer carry both the 5/6 and the XS, I only carry the size XS as the manufacturer has changed their sizing and now they are both the same size. ► Can I customize /personalize your shirts? YES! Everything - wording, colors, names can all be set to your desired look. Simply include instructions in the message to seller section. Yes but changes to a design can delay your order up to 3 BUSINESS DAYS. ►Can I return the item if it did not arrive in time for my event/date needed? ► How do your shirts run? My t-shirts all run differently on sizing. It is VERY important to check the sizing charts or send me a conversation to ensure that you are getting the correct size. I do not exchange shirts because of sizing issues. The sizing chart ONLY lists shirts in short sleeve for the Rabbit Skins brand as these run small. Please send me a conversation if you have any questions. ► Are your shirts sublimation , iron-on, vinyl? Most are made with the direct to garment printing. Some are made using sublimation and some are produced with digitally printed vinyl. I use both cotton shirts and polyester shirts. If the colors need to be bright and vibrant then most often the process will involve sublimation. What that means is that we use a cutting edge digital printing machine that actually dies the fabric. This means the fabric is not scratchy, won't crack or fade and retains the soft feel for many many washings. Some slight washing fade will occur with the cotton. ►Are the colors I see accurate? Sometimes the colors that are displayed come out darker or lighter when printed and not as vibrant as they appear on your display because the computer uses an RGB color scheme and the printers all use a CMYK scheme that cannot give a color mix that is as vibrant as the RGB. I take the design you see and that is printed to the shirt. the inks are absorbed by the fibers in the shirt and will not appear as vibrant as they do on your screen. Unfortunately all printers use the CMYK scheme so we cannot change that. There are some colors that are very hard for the printer to do including turquoise, teal and lime green. Please remember that the colors that you see on screen may end up darker or lighter on the actual product. The shirts you see are not the actual product printed but have the picture overlaid onto the garment for presentation purposes. ►Will my design look exactly the same as the picture in the listing? I do my best to make each design look exactly as the listing, but each design is a unique work of art, so there could be slight difference in the placement color and other design elements. ►Names submitted to be placed on items may not be printed in the exact order submitted. ►Please note: when personalizing names that end in the letter "s" the name will be added as "s' ", unless otherwise noted in the order details. ► How do I know if all of my changes will be made and how do I know what it will look like? I DO NOT automatically send proofs. If you request a proof it will delay your order up to 3-5 BUSINESS DAYS. If you make changes I will not automatically send a proof for approval. I will make your changes or contact you if I cannot make your changes, but DO NOT assume I will automatically send a proof. Please request order changes/adjustments by starting a conversation - **Please don't email me directly** Etsy encourages us to keep all conversations and correspondence on Etsy. I do have an email address as it corresponds to my other businesses but I get so much spam mail on there it takes me longer to see your email and sometimes it is deleted through the spam filter. Also Etsy asks that I keep all correspondence on Etsy so I WILL NOT respond to anything sent to my email. I carry many different types of shirts please contact me if you have any questions. Typically the toddler run small, the youth are true to size and the adult run on the large side. I only provide proofs on new creations not on designs that are getting simple changes. I do take custom orders.